The Mobile Service Unit (MSU) is principally a “Workshop on Wheels” with a variety of workshop equipments installed on any vehicle platforms. 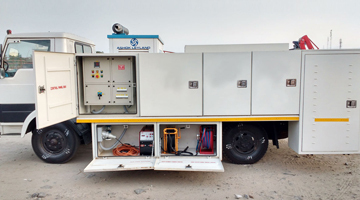 The Mobile Service Units are extensively used in Automobile Industry, Tyre Service Industry, Construction Industry, Cement Industry, Iron & steel plants, Mining Industry and defence, where there is a requirement to service equipment or machinery in remote areas. 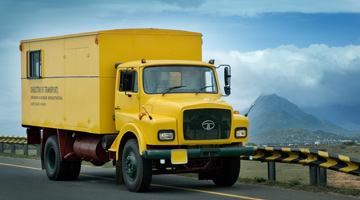 Mobile Service Units reduce machine breakdown time and helps in Total preventive maintenance of machines. Apart from traditional breakdown services Mobile Service units are widely used for Preventive & Periodic maintenance of the Vehicle’s / Equipments / Machinery’s. Elgi pioneered the Mobile Service Technology in 1976 with building its first MSU (Mobile Service Unit) for Bhilai Steel plant. Elgi, now with the expertise of building over Three Thousands of MSU’s and with its dedicated R&D team for continuous product improvement delivers MSU’s with best ergonomic design, ruggedness, aesthetics and safety. A good volume of MSU’s over 4 Decades are made and still running at their best, worldwide. 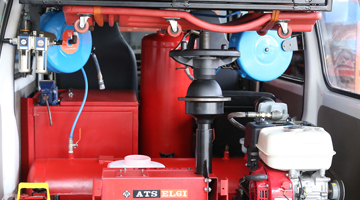 ATS ELGI Mobile Service Units comprise service equipments like Air Compressor, Grease Pumps, Oil Pumps, Hose Reels, Diesel Generator Set, Control Panel, Arc Welder, Bench Grinder, Vehicle Washer, Tools Box, Accessories Kit, Diesel / Water storage Tank, Emergency Lamp, First Aid Box, Fire Extinguisher, etc., Each of the Mobile service units are custom built as per customer and industry specific requirement. Being the first and foremost business of ATS ELGI, Mobile Service Units are built to survive in rugged conditions and to uphold the brand image of the Company.